Clockwise, from top left: Alicia Kane, Michael Kane, Jamie Biggs and Kimberly Andrews. 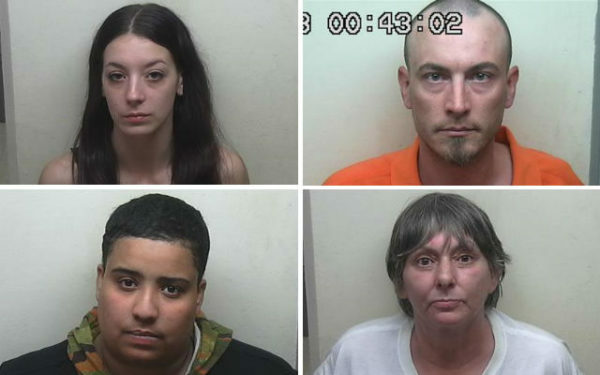 Three Mainers and a Connecticut man were arrested Thursday after drug agents say they operated a heroin trafficking ring throughout central Hancock County. Undercover agents with the Maine Drug Enforcement Agency and Downeast Drug Task Force allegedly purchased heroin from the targets of a month-long investigation into importation and sale of heroin. On Thursday night, agents searched the home of Michael and Alicia Kane on Francis Lane in Lamoine, where they allegedly recovered approximately 51 grams of heroin with a retail street value of $15,000, according to a release from Stephen McCausland, spokesman for the Maine Department of Public Safety. Michael Kane, 31, and Alicia Kane, 29, were charged with Class B felony unlawful trafficking of scheduled drugs (heroin). Also arrested at the home were Jamie Biggs, 28, of New Britain, Connecticut. Biggs was charged with Class A felony aggravated trafficking in scheduled drugs (heroin), and Kimberly Andrews, 51, of Holden, was charged with misdemeanor unlawful possession of scheduled drugs. Biggs’ bail was set at $10,000 cash, the Kanes’ bail at $5,000 cash and Andrews’ bail at $1,000. The Hancock County Sheriff’s Office, Ellsworth police and Maine State police assisted in the operation.